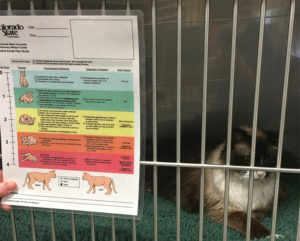 Research in cats demonstrates that to identify pain, assessment of behavior is more valuable than objective measures, such as heart rate and blood pressure.10,11 Assessing behavioral changes along with a thorough physical examination, when possible, is vital during the preanesthesia process. If a human would perceive a procedure as painful, assume that the veterinary patient will also experience pain. FIGURE 1. 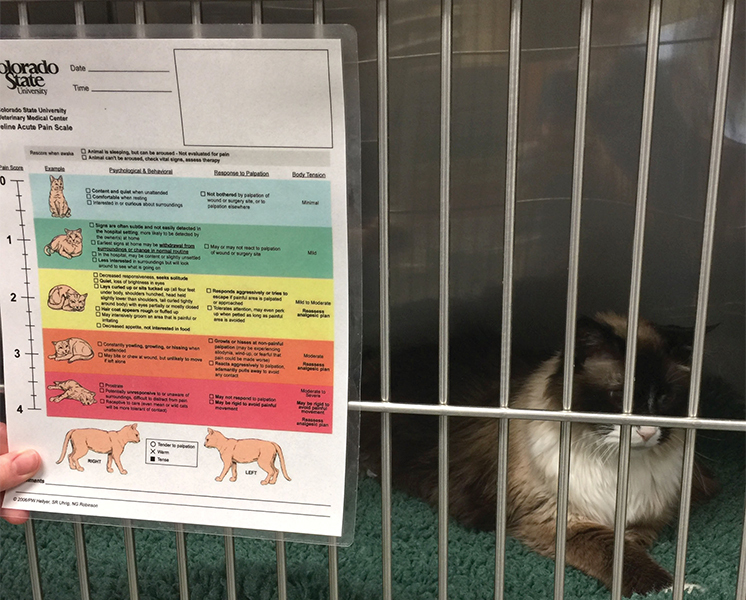 Assessment of a recovering patient using the Colorado Pain Scoring for the cat. The author suggests laminating your preferred pain scoring chart and hanging it on patient cages that require pain assessments. This gives a visual guide and reminds veterinary nurses that pain assessment is ongoing and important. The veterinary professional must provide adequate and appropriate analgesia. Pain assessment should be implemented during every visit and at regular intervals after surgery (FIGURE 1). Furthermore, a standard best practice is to recognize and treat acute pain by providing analgesia during the perianesthesia period and upon presentation of a traumatic event. 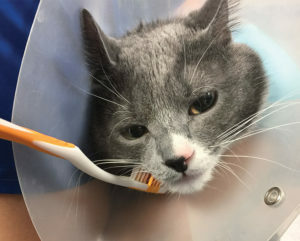 However, some practitioners still hesitate to provide appropriate analgesia to cats because they fear undesirable or harmful side effects (i.e., opioid mania, hyperthermia, renal injury).12 This article focuses on identifying acute pain in our feline patients and explores analgesic options to improve awareness and veterinary care. FIGURE 2. Characteristic postures and behaviors of a painful cat: arched back, appearing uncomfortable in back of cage, slanted/pinned ears, preparing to strike the veterinary nurse who dares to approach. The Glasgow Feline Composite Measure Pain Scale, developed for evaluation of acute pain in cats, uses ear position and muzzle shape in addition to the previously mentioned measures to provide quantifiable, validated pain scoring. To download a PDF of the pain measure scale, click Glasgow Feline Composite Pain Measure Scale. Another measure, the Colorado Pain Scale, is not validated but is easy to implement and simple to use for routine pain scoring in a variety of clinical practices (FIGURE 1). A more complex, validated pain scoring option for cats is the Botucatu Multidimensional Pain Scale. It considers pain expression, psychological variables, and physiologic changes to quantifiably assess for pain. Once the patient has been identified as painful, how should we address the pain? 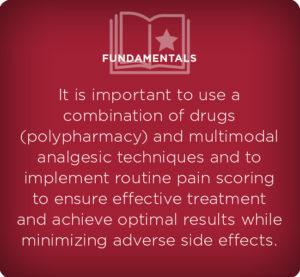 It is important to use a combination of drugs (polypharmacy) and multimodal analgesic techniques and to implement routine pain scoring to ensure effective treatment and achieve optimal results while minimizing adverse side effects. Different classes of drugs address the variety of pain receptors within the body. Often, using a polypharmacy, multimodal analgesic technique can optimize successful management of acute pain while minimizing adverse effects by allowing lower dose of each medication. Cats differ from other species when it comes to pharmacokinetics. The feline species vary from their canine counterparts in several drug conjugation pathways, leading to an increased likelihood of undesirable toxic effects if dose and frequency are not decreased or if certain drugs, such as acetaminophen or aspirin, are not completely avoided. Regardless of these species differences, cats benefit from implementation of pre-emptive, aggressive pain management to help decrease central sensitization (windup) and reduce postoperative analgesic requirements.16 In addition to reducing the postoperative analgesic requirement, premedication with analgesics allows reduced induction and maintenance anesthetic requirements, smoother recoveries, and greater intraoperative stability. The synergistic activity achieved with combining a sedative, such as acepromazine or dexmedetomidine, with an opioid allows for lower doses of both classes of drugs. This maximizes benefit while minimizing negative side effects. It is undeniable that opioids are the cornerstone for addressing acute pain, and their reversibility improves their safety. Opioids can be effectively used in cats. They can be administered systemically or in regional analgesic techniques, such as epidurals. With epidurals, it is important to recognize anatomic differences between cats and dogs. In cats, the spinal cord ends more often as distal as the first sacral vertebra, compared with the sixth lumbar vertebrae in the dog; this predisposes to the likelihood of subarachnoid injection (i.e., encountering cerebral spinal fluid [CSF]) and cranial migration of the epidural solution. If CSF is encountered, reducing the total volume of the epidural injection is indicated, along with giving the injection slowly, as with any epidural or subarachnoid injection. Despite the differences between cats and other species, opiates should not be avoided if they are necessary to control feline pain. There are, however, some misconceptions regarding opiates and their use in cats. “Morphine mania” originated from early reports of doses much higher (10 and 20 mg/kg) than routine clinically relevant doses.17-19 Kamata et al looked at behavioral effects of morphine and fentanyl in cats and found that morphine delivered at doses closer to clinically relevant dosing (0.3 to 2.4 mg/kg) produced euphoria and decreased locomotor activity compared with fentanyl (5 to 40 mcg/kg), which produced increased locomotor activity in a majority of cats.8 This is not to suggest that fentanyl cannot provide analgesia to cats but rather that cats respond differently to various opioids and differently than dogs do. Additionally, opioids provide less reduction in minimum alveolar concentration (MAC) in cats than in dogs.20 Morphine, hydromorphone, methadone, meperidine, fentanyl, sufentanil, alfentanil, buprenorphine, and butorphanol have all been evaluated in cats and can be used safely and effectively with appropriate dosing and for appropriate pain management (butorphanol, for example, should not be used for moderate to severe pain). Full agonist opioids cause hyperthermia in cats (hydromorphone at 0.1 mg/kg, morphine at >1 mg/kg).21-23 There is a shortage of full agonists in the United States; if regular buprenorphine is available, intravenous administration has shown more predictable antinociception along with faster onset than subcutaneous or intramuscular injections.24 Veterinary professionals should remain flexible in switching opioids if the response is inadequate or undesirable response and should consider adding adjunctive therapies when opioids alone are inadequate. Longer-lasting, extended-release formulations of buprenorphine are commercially available; for example, Simbadol® (zoetis.com) is labeled to be given subcutaneously q24 for up to 3 days, with the first dose given approximately 1 hour before surgery. The author elects to closely observe body temperature when any opiate is used. Nonsteroidal anti-inflammatory drugs (NSAIDs) help reduce and prevent inflammation after surgery, thereby improving a patient’s comfort during recovery. They exert their effects by inhibiting cyclooxygenase enzymes; these enzymes synthesize prostaglandins, which in turn precipitate the inflammatory process. They should be used cautiously in cats because of felines’ limited ability for the hepatic glucuronidation required to metabolize NSAIDs. When dose, frequency, and duration are not carefully administered, this limited ability can increase the potential for toxic effects. Cats seem to be particularly susceptible to the negative renal effects of NSAIDs. Preoperative use is somewhat controversial because intraoperative hypotension can exacerbate the incidence of renal effects. Postoperative administration is advantageous for patients that remain normotensive under anesthesia. NSAIDs require a washout period between interchanging of their use. Additionally, they should never be used with corticosteroids or aspirin. Local analgesics are likely the cheapest, most accessible, and most underused analgesics. Frequently used drugs in this category include lidocaine, bupivacaine, and mepivacaine. They exert their analgesic ability by blocking sodium channels and subsequently the transduction of nociceptive signals to the spinal cord, thereby helping to inhibit central sensitization. The hesitation to use these agents in cats may be attributed to cats’ lower tolerance to toxic effects; however, this concern is easily mitigated by using appropriate dosing and always aspirating to avoid accidental intravenous injection. Toxic doses, onset of action times, and duration of action differ; lidocaine has the fastest onset time, the shortest duration of action, and the highest toxic dose, followed, respectively, by mepivacaine and bupivacaine (TABLE 1). 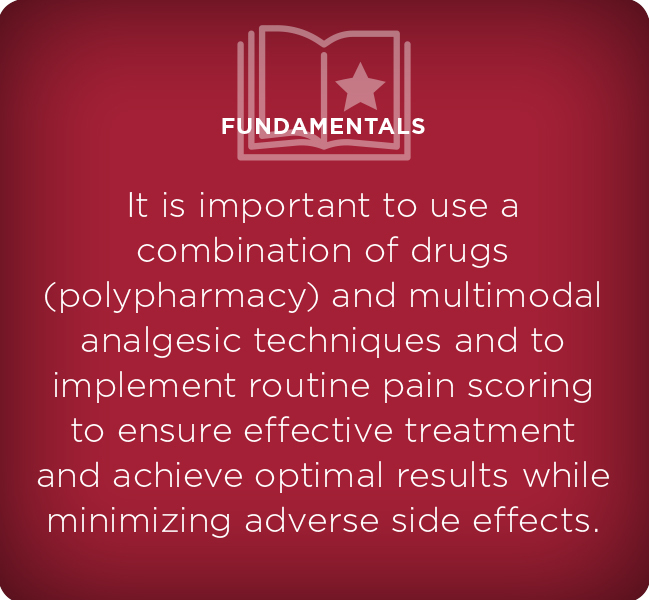 Another benefit to this class of analgesics is the many ways to implement their use. From infiltrative, splash, transdermal, and regional applications, these techniques can be effective in a variety of clinical situations, such as dentistry, soft tissue surgeries, and orthopedics. Lidocaine patches can be placed over incisions to provide local relief after surgery. Splash blocks, although their efficacy is questionable, can be used before closing of the subcutaneous layer following an open–body cavity procedure. Xylazine, medetomidine, and dexmedetomidine are α2 agonists that provide sedation, muscle relaxation, and analgesia. They work synergistically with opioids and are routinely used as part of the premedication before induction of anesthesia because of their predictable effect. They can significantly reduce induction and maintenance drug requirements and have potent cardiovascular side effects, including vasoconstriction with a reflex bradycardia, followed by centrally mediated hypotension. When these agents are used intravenously or in debilitated patients, judicious dosing is warranted. Xylazine has been identified as a contributor to perioperative mortality in cats.32 Safer alternatives, such as medetomidine and dexmedetomidine, exist for the perianesthetic periods; thus, xylazine is no longer recommended as a premedicant for cats. Like opiates, α2 agonists have a reversal agent, atipamezole. They provide better sedation and analgesia when used with opiates.33 The α2 agonists can be used as single injections for premedication and to help smooth postoperative recovery (often as microdoses); they can be given as a constant rate infusion for sedation and analgesia intra- or postoperatively, and they can be administered epidurally34 and buccally.35 Because of their reversibility and quick onset, they can facilitate a quick diagnostic test, blood draw, or physical examination while minimizing the stress on the patient. Sufficient pain relief results from a combination of pharmacologic and nonpharmacologic approaches and is an important part of outstanding patient care in cats. 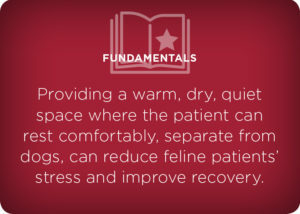 Providing a warm, dry, quiet space where the patient can rest comfortably, separate from dogs, can reduce feline patients’ stress and improve recovery. For patients placed under anesthesia, expressing the bladder before recovery can improve patient comfort. 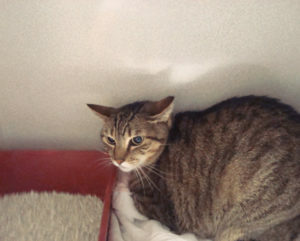 Cats tend to like a box to hide in or to shield them from the disruptive nature of a veterinary hospital. Remember, cats do not always express their pain with outward signs as humans or other common species do. Behavioral activities, such as return to grooming, litter box use, and eating/drinking, should be monitored as part of the pain assessment. FIGURE 3. Assisted “fear-free” restraint and distraction with standard toothbrush to allow evaluation of wound on leg. Pheromone therapies can be used to reduce stress and encourage normal behavior. Minimizing excessive restraint with the use of towels and avoiding scruffing can also improve the patient’s experience. A toothbrush is a vital tool to allow the handler to comfort or distract the cat while maintaining a safe distance (FIGURE 3). Also worth considering are emerging nonpharmacologic therapies for postoperative pain and inflammation, including acupuncture, ultrasound, laser therapy, cryotherapy, and pulse electromagnetic field therapy. As veterinary nurses we have an obligation to be our patients’ advocate for a comfortable, positive experience without pain. Our challenge is to recognize our patients’ pain and communicate their needs to the veterinarian. 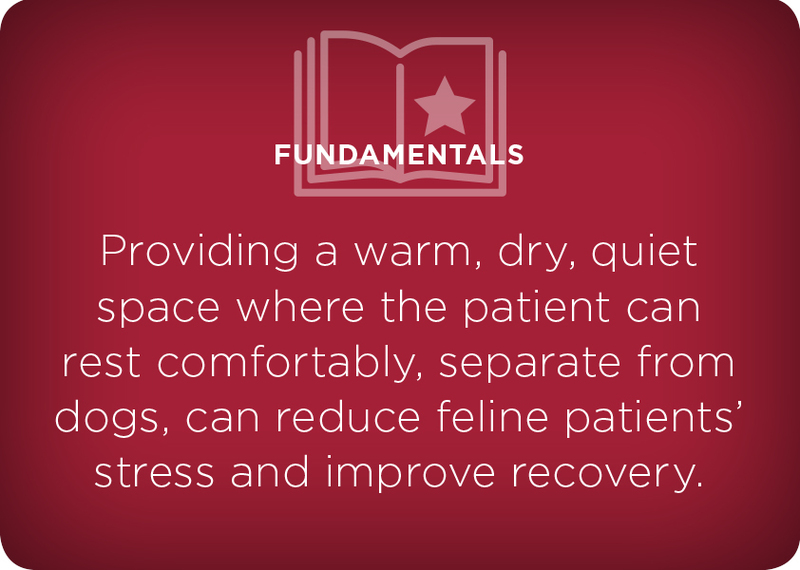 Given the challenges of today’s climate of opioid limitations, understanding polypharmacy analgesic options and how the cat may respond to them is vital for successful outcomes. International Association for the Study of Pain, Task Force on Taxonomy. Part III: pain terms, a current list with definitions and notes on usage. In: Merskey H, Bogduk N. Classifications of Chronic Pain, 2nd ed. Seattle, WA: IASP Press; 1994:209-214. Paul-Murphy J, Ludders JW, Robertson SA. The need for a cross-species approach to the study of pain in animals. JAMVA 2004;224(5):692-697. Williams V, Lascelles B, Robson M. Current attitudes to, and use of, perioperative analgesia in dogs and cats by veterinarians in New Zealand. N Z Vet J 2005;53(3):193-202. Coleman D, Slingsby L. Attitudes of veterinary nurses to the assessment of pain and the use of pain scales. Vet Rec 2007;160(16):541-544. Lascelles B, Capner C, Waterman-Pearson A. A survey of current British veterinary attitudes to perioperative analgesia for cats and small mammals. Vet Rec 1999;145:601-604. Johnson J, Robertson S, Pypendop B. Antinociceptive effects of butorphaonol, buprenorphine, or both, administered intramuscularly in cats. Am J Vet Res 2007;68(7):699-703. Lascelles B, Roberston S. Use of thermal threshold response to evaluate the antinociceptive effects of butorphanol in cats. Am J Vet Res 2004;65(8):1085-1089. Kamata M, Nagahama S, Kakishima K, Sasaki N, Nishimura R.. Comparison of behavioral effects of morphine and fentanyl in dogs and cats. J Vet Med Sci 2012;74(2):231-234. Epstein M, Rodan I, Griffenhagen G, et al. 2015 AAHA/AAFP pain management guidelines for dogs and cats. JAAHA 2015;51(2):67-84. Smith JD, Allen SW, Quandt JE, Tackett RL. Indicators of postoperative pain in cats and correlation with clinical criteria. Am J Vet Res 1996;57(11):1674-1678. Cambridge A, Tobias KM, Newberry RC, Sarkar DK. Subjective and objectives measurements of postoperative pain in cats. JAVMA 2000;217(5):685-690. Hewson C, Dohoo I, Lemke K. Perioperative use of analgesics in dogs and cats by Canadian veterinarians in 2001. Can Vet J 2006;47(4):352-359. Slingsby L, Jones A, Waterman-Pearson A. Use of a new finger-mounted device to compare mechanical nociceptive thresholds in cats given pethidine or no medication after castration. Res Vet Sci 2001;70(3):243-246. Taylor P, et al. Morphine, pethidine and buprenorphine disposition in the cat. J Pharmacol Therap 2001;24:391-398. Taylor P, Roberston S. Pain management in cats-past, present and future. Part 1. The cat is unique. J Feline Med Surg 2004;6(5):313-320. Slingsby L, Lane EC, Mears ER, Shanson MC, Waterman-Pearson AE. Postoperative pain after ovariohysterectomy in the cat: a comparison of two anaesthetic regimes. Vet Rec 1998;143(21):589-590. Penney BE, White RJ. Narcotic analgesics in the domestic cat. Vet Clin North Am Small Pract 1978;8(2):317-324. Dhasmana K, Dixit K, Jaju B. Role of central dopaminergic receptors in manic response of cats to morphine. Psychopharmacologia 1972;24:380-383. Fertziger A, Stein E, Lynch J. Letter: suppression of morphine-induced mania in cats. Psychopharmacologia 1974;36(2):185-187. Ilkiw J,Pascoe P, Tripp L. Effects of morphine, butorphanol, buprenorphine, and U50488H on the minimum alveolar concentration of isoflurane in cats. Am J Vet Res 2002;63:1198-1202.
of intravenous hydromorphone in cats. Vet Anaesth Analg 2007;34(2):132-138. Niedfeldt R, Robertson S. Postanesthetic hyperthermia in cats: a retrospective comparison between hydromorphone and buprenorphine. Vet Anaesth Analg 2006;33:381-389. Steagall P, Pelligand L, Giordano T. Pharmacokinetic and pharmacodynamic modeling after intravenous, intramuscular or subcutaneous adminstration of buprenorphine in cats. Vet Anaesth Analg 2013;40(1):83-95. Slingsby L, Waterman-Pearson A. Postoperative analgesia in the cat after ovariohysterectomy by use of carprofen, ketoprofen, meloxicam or tolfenamic acid. J Small Anim Pract 2000;41(10):447-450. Gunew M, Menrath V, Marshall R. Long-term safety, efficacy and palatability of oral meloxicam at 0.01-0.03 mg/kg for treatment of osteoarthritic pain in cats. J Feline Med Surg 2008;10(3):235-241. Gibbon K, Cyborski J, Guzinski M. Evaluation of adverse effects of EMLA (lidocaine/prilocaine) cream for the placement of jugular catheters in healthy cats. J Vet Pharmacol Ther 2003;26(6):439-441. Wagner K, Gibbon KJ, Strom TL, Kurian JR, Trepanier LA. Adverse effects of EMLA (lidocaine/prilocaine) cream and efficacy for the placement of jugular catheters in hospitalized cats. J Feline Med Surg 2006;8(2):141-144. Cuvillon P, Nouvellon E, Ripart J,et al. A comparision of the pharmacodynamics and pharmacokinetics of bupivacaine, ropivacaine (with epinephrine) and their equal volume mixtures with lidocaine used for femoral and sciatic nerve blocks: a double-blinded randomized study. Anesth Analg 2009;108(2):641-649. Pypendop B, Ilkiw J. The effects of intravenous lidocaine adminstration on minimum alveolar concentration of isoflurane in cats. Anesth Analg 2005;100(1):97-101. Pypendop B, Ilkiw J. Assessment of the hemodynamic effects of lidocaine adminstration IV in isoflurane-anesthetized cats. Am J Vet Res 2005;66(4):661-668. Brodbelt D, Pfeiffer D, Young L, Risk factors for anaesthetic-related death in cats: results from the confidential enquiry into perioperative small animal fatalities (CEPSAF). Br J Anaesth 2007;99(5):617-623. Selmi A, Mendes GM, Lins BT, Figueiredo JP, Barbudo-Selmi GR. Evaluation of the sedative and cardiorespiratory effects of dexmedetomidine, dexmedetomidine-butorphanol, and dexmedetomidine-ketamine in cats. JAVMA 2003;222(1):37-41. Souza S, Intelisano TR, De Biaggi CP, et al. Cardiopulmonary and isoflurane sparing effects of epidural or intravenous infusion of dexmedetomidine in cats undergoing surgery with epidural lidocaine. Vet Anaesth Analg 2010;37(2):106-115. Ansah O, Raekallio M, Vainio O. Comparing oral and intramuscular administration of medetomidine in cats. J Vet Anaesth 1998;25(1):41-46. Niyom S, et al. Effect of maropitant, a neurokinin-1 receptor antagonist, on the minimum alveolar concentration of sevoflurane during stimulation of the ovarian ligament in cats. Vet Anaesth Analg 2013;40:425-431. Vettorato E, Corletto F. Gabapentin as part of a mulit-modal analgesia in two cats suffering multiple injuries. Vet Anaesth Analg 2011;38(5):518-520. Brondani J, Luna SP, Marcello GC, Padovani CR. Perioperative administration of vedaprofen, tramadol or their combination does not interfere with platelet aggregation, bleeding time and biochemical variables in cats. J Feline Med Surg 2009;11(6):503-509. Pypendop B, Siao K, Ilkiw J. Effects of tramadol hydrochloride on the thermal threshold in cats. Am J Vet Res 2009;70(12):1465-1470. The objective of this article is to encourage the veterinary team member to recognize pain in the feline population and learn options for the effective management of acute pain. This article will help readers to recognize that cats differ from other species in how they express pain and respond to analgesics. It will also help readers to know what analgesics are available to effectively provide a multimodal, analgesic technique for acute pain situations. The article you have read has been submitted for RACE approval for 1 hour of continuing education credit and will be opened for enrollment when approval has been received. To receive credit, take the approved test online for free here. Free registration on VetFolio.com is required. Questions and answers online may differ from those below. Tests are valid for 2 years from the date of approval. Which is true about pain scoring? a. Routine pain scoring helps ensure analgesic treatment is adequate. b. Pain scoring should be part of the routine physical examination. c. Caretakers may be the most observant person to recognize changes in behavior to identify that a patient/pet is painful. Studies have shown that combining this oral drug with an NSAID provided better analgesia than when administered alone in cats. Which of the following has been determined as most valuable for evaluating pain in the cat? Which of the following statements is false regarding opioids and their use in cats? a. Opioids cause excitement in cats and should be avoided. b. Cats may respond differently to opioids than dogs. c. Cats may become hyperthermic and should be monitored closely. d. Buprenorphine was shown to be more reliable when given intravenously. What oral medication can be administered by the owner before a scheduled appointment to provide sedation and improved ease of handling? Pain is defined as an emotional or physical experience. Which class of drugs are cats particularly sensitive to compared to dogs, making it important to stay below a toxic threshold?